A1. Sugar Daddy "Hypnotise (Dr Packer Remix)"
A2. Situation "You Gotta Move (Ashley Beedle Remix)"
To accompany Situationism’s brand new compilation album, the unstoppable Dr Packer selects four of the heaviest cuts for this limited 12” sampler. Up first the man himself Dr Packer provides an exclusive, unreleased, bumping dancefloor friendly remix of ‘Sugar Daddy’, before Black Science Orchestra’s Ashley Beedle works his magic with this broken beat styled reworking of Situation ft Andre Espeut ? ‘You Gotta Move’. On the flip side, Peza serves up an acid tinged disco workout in the form of ‘On It’ with George Kelly closing out Vol. 1 with a killer dub of Katzuma ? ‘All Night’. 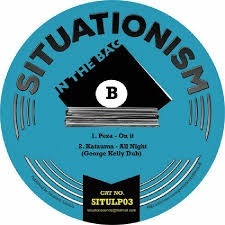 SITUATIONISM brings you a deep soulful house release by BitterSuite and Andre Espeut. 'These Thoughts' sees BitterSuite take the undeniably soulful vocals of Andre Espeut & melts them over a delicious deep house groove, warmed with chords & brought to the boil by a jazz funk fuelled live bass line. Julian Sanza brings his unique production style with this deeper edged, conga driven remix, building a truly hypnotic boogie experience, taking the vocals cleverly into a more dubstyle vibe. Situation take things a little more straight up deep soul house with sharp beats over a real fat old school synth bassline covered with the deepest chords, warm synths & of course Andre. Dan D3 delivers a moving house dub remix that hauntingly draws you into its infectious filter heavy trancelike groove ...built for late night shenanigans.